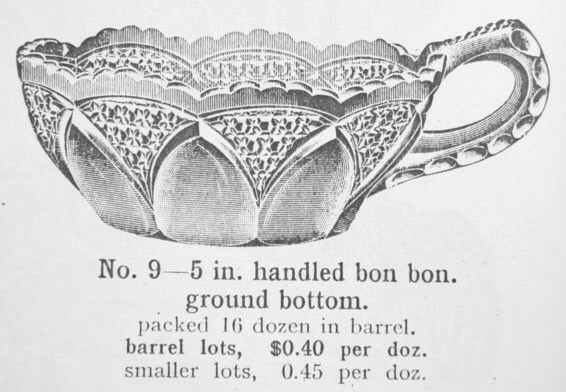 Page 166 - Handled Bon bon - 1909 Imperial Catalog. 5 inch TULIP & CANE Handled Nappy - Courtesy Bill Stoetzel. TULIP and CANE Nappy: One of the earlier Imperial designs, this single-handled 5” nappy in marigold is listed in a 1909 catalog ad. Written accounts list a dome footed bowl known in marigold and smoke, along with an 8 oz. goblet and a 4 oz. claret in marigold. A 3 oz. and 1 ½ oz. wine and wine cordial in marigold are also known. These older versions are not often seen in today’s world. Marked with the IG trademark, the 8 oz. 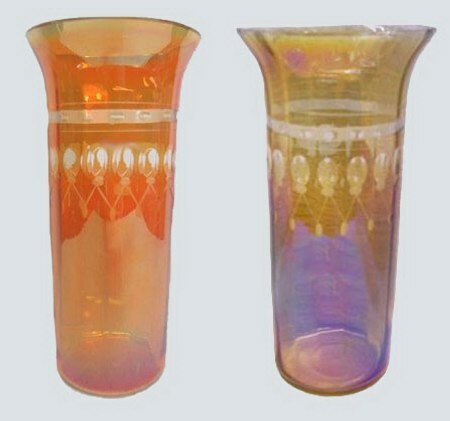 goblet was reproduced in 1970 in a color named Aurora Jewels. 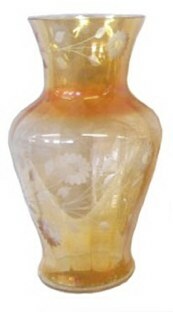 Star Medallion celery vase - Marigold. 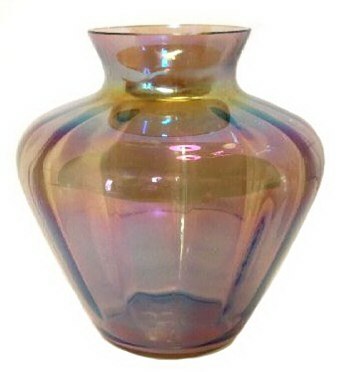 STAR MEDALLION Celery Vase: These celery vases are very scarce in any of the three known colors: clambroth, marigold or smoke. They virtually never appear in carnival glass auctions. 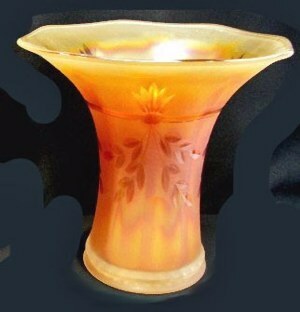 This marigold example was seen for sale on eBay. You may view the clambroth and smoke vases by clicking into our pattern alphabet on the homepage: --- S ---. Pg. 92 - Archer Imperial Glass Book. (Left) 10 in. Hand Cut Etched Lustre Vase. (Middle) Etched Lustre Cut Sprays. (Right) Etched Lustre line-part of the Lead Lustre assortment. ETCHED LUSTRE: This line of vases from Imperial Glass is actually part of their Lead Lustre assortments. Floral and stylized designs are available in very delicate detail. Usage over the years has taken a heavy toll on their existence. They are not often found. The marigold 6” size is one of 13 shape variations known in this line. Shapes and etchings vary in these 6”- 12” vases. Colors known are marigold, smoke and clambroth. Nuruby, Sapphire and Peacock are color names listed in factory catalogs. 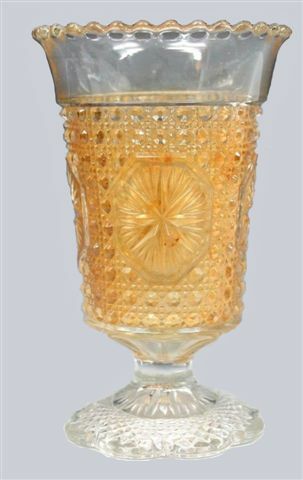 DIAMOND LACE Tumbler in (rare) marigold. 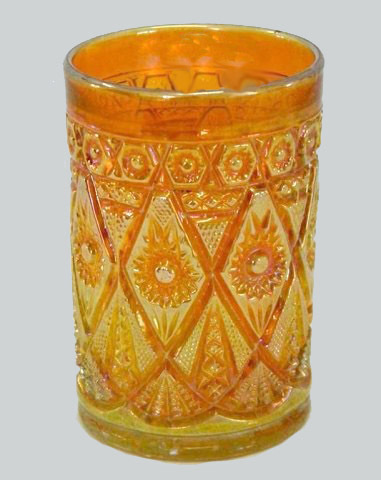 DIAMOND LACE Tumbler: Only three of these marigold tumblers have sold at auction over the past 10 years. The one perfect example brought more than $1,000. There is no known pitcher in marigold. A whimsied tumbler shaped into a rosebowl is known in marigold. Small PROPELLER Compote - 3 in. high x 4.25 in. across. 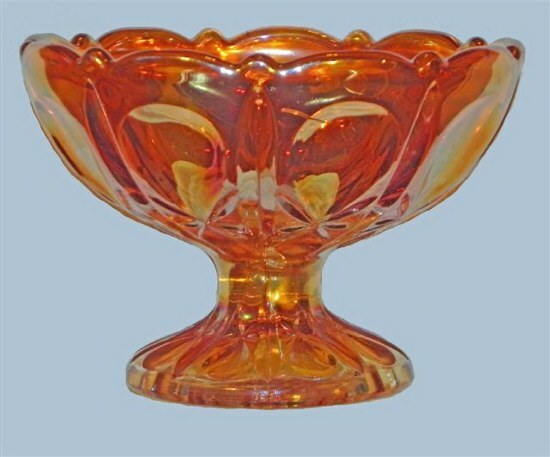 PROPELLER Compote: The large 8” compote is quite scarce. 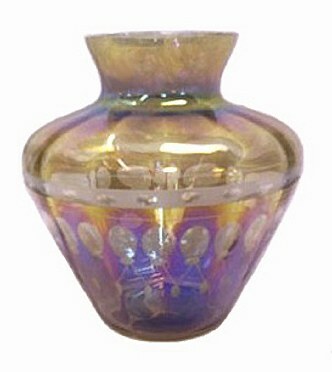 There is a rare stemmed vase in the pattern. It can be seen by clicking into --- P --- in the pattern alphabet shown on our homepage. These small compotes are found in marigold, purple, helios, smoke and green. (Left) 6 in. Smoke ETCHED BALLOONS. (Right) 6.25 in. high x 3 in. base - Smoke Imperial BALLOONS. Marigold and Smoke Imperial #768. Cylinder Vases - 9 in. high BALLOONS. 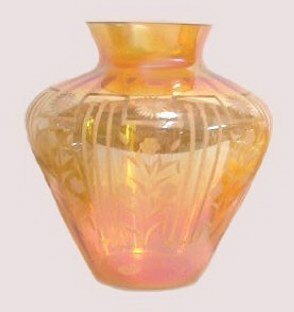 BALLOONS: vases are a part of the Lead Lustre assortment. 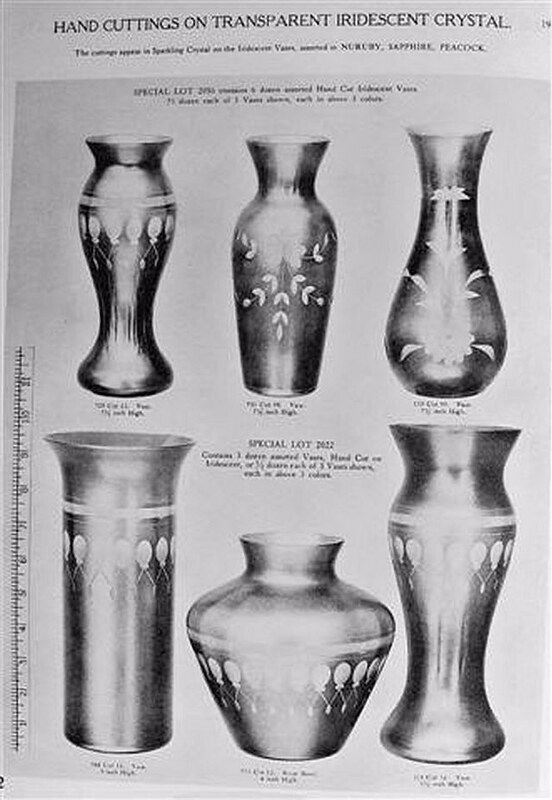 There are 13 different vase shapes shown in old Imperial Factory catalogs. Vases range in height from 6” - 12”, hand cut or etched and hand blown. Nuruby, Sapphire and Peacock are colors listed. Carnival collectors know those colors as marigold, smoke and clambroth. nourished in the words of faith and of the good doctrine which you have carefully followed. But reject profane and old wives’ fables, and exercise yourself toward godliness. Having promise of the life that now is and of that which is to come. Especially of those who believe. These things command and teach.